Ok.. be honest when I ask you if you have heard of chimichurri? I had to Google It and found some really amazing recipes in addition to the one I’m sharing on my site today. Today’s share is grilled garlic and summer squash skewers that make a healthy and satisfying grilling summer side dish. If you didn’t grow a squash plant and have tons of harvest it usually brings this time of year then you can absolutely find an abundant harvest at the local farmers market. Combined with a green and herby chimichurri sauce, this is the perfect paired with a main grilled course. I hope you will give this recipe a try and share with me at the bottom of the post what you think! For the chimichurri, in a large bowl, combine the parsley, basil, garlic, olive oil, salt, and pepper. Set aside. For the skewers, place the garlic cloves on a small baking sheet, drizzle with the olive oil, and toss well. Roast until lightly golden, about 10 minutes. Transfer to the bowl of sauce. Add the zucchini, yellow squash, and bell pepper to the bowl and toss well. Thread the vegetables and garlic cloves onto skewers and set aside. Preheat a grill pan over high heat or anoutdoor grill to high. Grill the skewers until lightly brown and cooked through, about 3 minutes per side. Drizzle with any remaining sauce and serve hot. It was such a relieve to walk over to my larger veggie garden and find that it was looking super happy despite the lack of rain and the weeds I’ve not been pulling. The soaker hoses I laid in early summer and the straw being used in a few of the isles as mulch is truly doing its job. 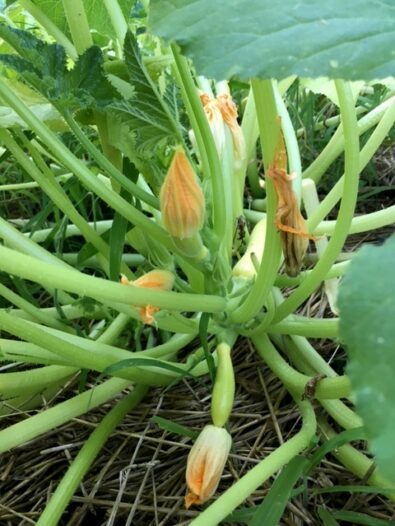 I’m very excited that the crookneck squash and the zucchini has been growing healthy since early June. In years past I usually get that mildew issue before August. 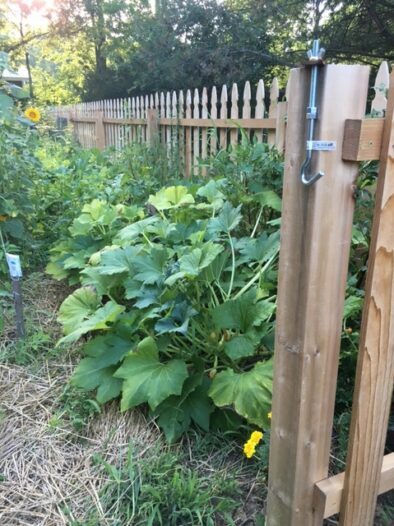 In the second photos in the gallery below is the view into the new fenced in veggie and bloom garden. 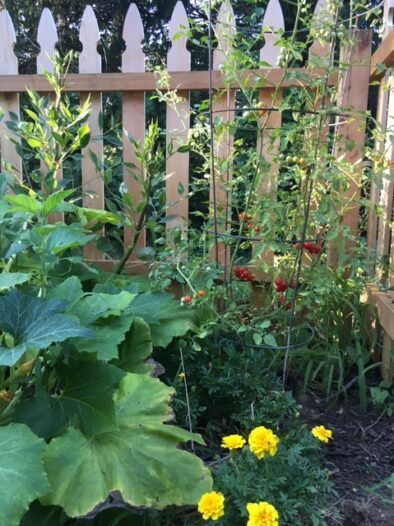 A new tomato trial this year for me is the ‘Candyland’ which is featured in the images below paired with yellow marigolds and the crookneck squash on one side. Early August in my veggie garden. squash, tomatoes and marigolds in the big garden at sunset. [alert-announce] What are you excited to harvest this summer season? Are you creating any new recipes with that harvest that you would be willing to share with me. Please connect with me by commenting below. I look forward to cooking it up with you!